Parlor Games or Parlour Games, Street Games or Childhood Games are our kids favourite past time before but the fast-paced technology changes the game play to iPad and Andoid Tablets where Angry Birds or Fruit Ninja is more preferred. This year, as Havaianas celebrates 50 years, fun and fair play brought back big smiles in the missed street games: Bato lata, Chinese garter, Patintero (tubig-tubig), Sipa, Agawan base (bahaw-bahaw), Lakad bunot, Tumbang preso, and Piko in the 3rd Havaianas Playback Invitational at the Siliman University West Quadrangle in Dumaguete City last February 25, 2012. 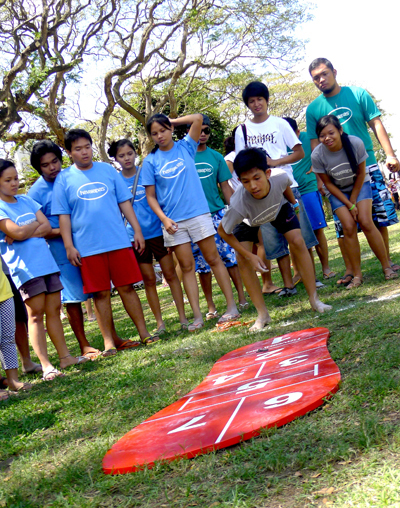 Havaianas, in cooperation with the Siliman University Student Government and Council of Student Organizations, gathered 12 student organizations: Sigma Rho, Medical Technology, Zambo Sur Sillimanites, AgusanSillimanites, Pan Hellenic Society, Ang Sandigan, Tau Gamma Phi, Omicronian Society, Kadugong Bol-anon (KADBOL), Philippine Institute of Cumputer Engineering Students (PHICES), Renaissance Youth Leaders Forum (RYLF), and College of Education Student Organization (CESO). Happy Squad Special Award - Agusan Sillimanites (Plaque) - the team with the happiest and loudest cheer and chant. The Early Birds Award - The Omircronian Society (Plaque) -the first team to complete registration. Havaianas Playback first launched in 2008 at Bonifacio High Street, Metro Manila. Then in August 2010, it was a collegiate inter-organization invitational participated in by schools such as Ateneo De Manila University, U&AP, U.P. Diliman, and De La Salle University. Havaianas Street Fun from havaianas cebu on Vimeo. In a flurry of artistic expression, 15 Art students converged suddenly at The Terraces, Ayala Center Cebu giving mall-goers a taste of sunshine with Havaianas Street Fun, a welcome break from the oppressive weather lately. Capoeira Artists and drum beaters quickly joined in the fun in the unique flash mob activity with a chalk art drawing representing Havaianas in the middle of the Terraces. Drumbeaters made passers-by sway to the beat of summer while capoeira enthusiasts showed off awesome high-kicks and acrobatic moves that combined martial arts, music and dance. 0 comments: on "Havaianas Playback 2012 in Siliman brings back Pinoy Street Games"